When I began this series back in Woodturning issue 233, I started by saying that I hoped the next year would be full of interesting work, otherwise, it would be a short lived series. Here we are at the end of the 13-part series and, looking back, it certainly has been a year full of challenges with a whole range of interesting jobs and a few entertaining situations thrown in for good measure. On my travels to different clubs around the UK, I have only received positive feedback that people have been enjoying the series and have been interested to see what I've been up to each month. 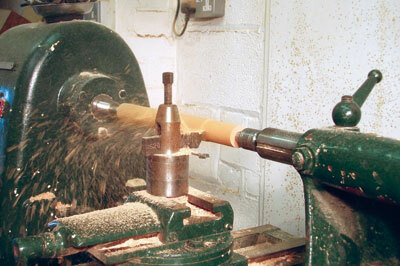 The question I am asked most is, "How's that lathe of yours?" You might remember back in issue 236 I took delivery of my Wadkin RS8 - that was in August last year - so after a year of ownership, I can honestly say it was the best decision I could have made. I have used it to capacity a few times for the long walnut (Juglans regia) poles for a shop display and for the large burr oak (Quercus robur) bowls I made earlier this year. One thing I am frequently asked to make are leg extensions for tables or chairs. Sometimes because of wear and tear, sometimes because an antique piece of furniture has been bought and the new owner decides it would benefit from being a little higher. I've also had to make them for people with pets that chew on the lower legs of furniture. More often than not the customer wants something plain that simply does the job; this month I was asked to turn four leg extensions for some antique chairs that had suffered over the years. I was sent a photo of the existing chairs along with a couple of images of how the customer wanted them to look, a rough sketch giving dimensions and the shape that would suit his chairs. The customer wanted them made in a timber that would match his mahogany (Khaya ivorensis) chairs so I used sapele (Entandrophragma cylindricum), a good mahogany substitute which can be stained and polished to blend in almost perfectly with the original. Often with leg extensions they need to be made with a hollow or cup at the top for the existing leg to sit in, sometimes with a hole drilled down the centre for a screw to fix them in place. With these, the customer was going to cut off the damaged section of the lower leg and drill a hole for these new sections to be glued in to. A simple copying exercise and another happy customer. It always surprises me how often customers want simple turned dowels either to an odd length or diameter or in timbers that are not commonly available. One such job came in last month which enabled me to dust off the sliding carriage for the second time since having the Wadkin. The sliding carriage is very handy for straight cuts on relatively short lengths of timber; if it is too long or thin then the cutting action is rather coarse and it just makes the wood bounce and chatter uncontrollably. 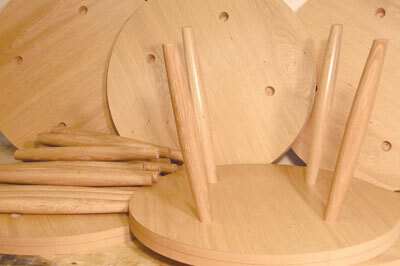 I was contacted last month by a customer who wanted 200, 31mm diameter dowels, 40mm long, made in beech (Fagus sylvatica). I'm not entirely sure what they were being used for but I do know they were a component for a larger, more complex job. I decided the easiest way to make them was to cut longer lengths of timber, turn them to diameter with the sliding carriage and then to length using the fine tooth blade on my tablesaw. I estimated that a 350mm length of beech would be stable enough and I would be able to cut eight dowels from this length, so I set to it. Ripping 25 strips of 35mm square beech from a board and cutting them into 350mm lengths, I then roughed them down between centres with a spindle roughing gouge, just so they were round and then set up the sliding carriage. In the few months since last using it I had forgotten just how heavy it is, but after blowing the thick layer of dust off of it I man handled it up onto the lathe bed. I re-sharpened the cutter and set it up so two passes of the cutter would remove the excess wood and take it down to within about 0.5mm of my final dimension. The finish was as good as I would expect from a spindle roughing gouge so after turning them all to this stage I power sanded them with 180 grit, hand sanded with 240 and was ready to cut them to length. One thing that I am always aware of when cutting cylinders on either a bandsaw or tablesaw is the potential risk of the wood spinning when it comes into contact with the blade; this can of course lead to bruised fingers if not potentially much, much worse. Because of the small diameter of these dowels I was comfortable doing this but for much larger diameters I would have made a 'V' shaped jig similar to that from last month's article. 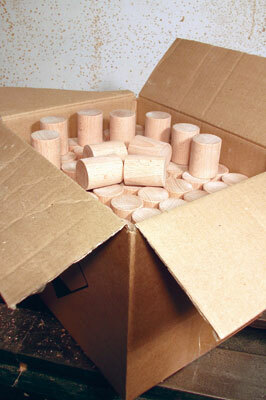 As it was, the saw made light work of cutting these and I quickly had 200 dowels. The job specified that all edges should be 'de-burred' so, rather than sit and hand sand the edges, I set up a sanding arbor in the chuck of the lathe and power sanded the ends and the edges to remove the arrises. This took longer than any other part of the job so far but, as I did it, I put them into a box and they were immediately ready to send out. 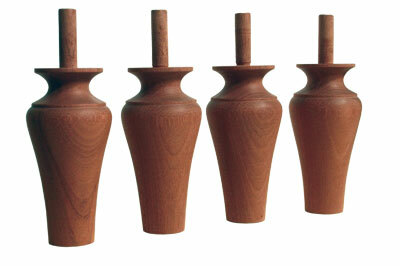 Another regular client contacted me last month with a design for some stools they wanted making. These were to be upholstered so the tops were to be made of veneered MDF, that way when you look on the underside they appeared to be made from solid oak; they then had turned, solid oak legs. The legs were actually the easy part for me, having an angled cut at the ends and turned between centres to shape. It was the tops that caused more of a challenge. The tops were 36mm thick so I laminated two pieces of 18mm MDF together, one being oak veneered. I then had to decide whether it was best to turn them or cut them out another way. After pondering on it for a few days I decided that, although possible to turn the 550mm diameter on the lathe, it would be much easier to make a template and cut them out using my router table. I ordered a new cutter which cut with a shear angle and was bearing guided. These cutters are specially designed for use with veneers and laminates and it lived up to the hype, cutting all around the edge without any splintering of the oak veneer. Drilling for the legs was the next issue. When I have made stools before; they have always been of smaller diameter and so have fitted on my pillar drill with the table tilted to the angle. However, because of the large diameter, these wouldn't fit, so after a little head scratching, I decided I needed another jig. The jig can be seen in the photo above; it is fixed to the drill's table and sets the surface at the required 15° from vertical. I fixed some strips at the back to make positioning repeatable and I was almost ready. 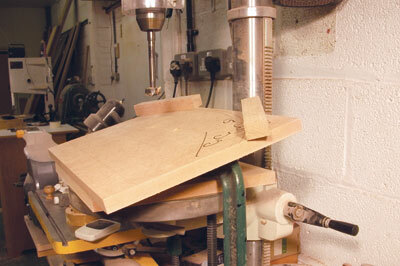 I realised that I needed to be careful when drilling so I didn't splinter the veneer. I had a few ideas but started, using an offcut, with the simplest and cheapest. I placed two pieces of masking tape over the area to be drilled like a cartoon plaster in a cross and marked the centre of the hole with a marker pen, then carefully drilled with a Forstner bit. I tested it a few times to be sure and was pleased that it worked perfectly, so I marked the positions of all 24 legs and drilled the holes. After test fitting all of the legs in the holes and adjusting as was needed, I sprayed all of the parts with three coats of 30% sheen clear lacquer and, once dry, did a dry assembly to make sure all the legs still fit and the stools all stood flat without rocking. I was pleased with the outcome and packed them up to send off to the customer.